David Connolly is the founder of the British Archaeological Jobs and Resources (BAJR) website and runs, along with archaeologist Maggie Struckmeier, the Past Horizons website, a web portal specializing in the reporting of archaeological news and projects from around the globe. Formerly a guitarist and key member of punk band Oi Polloi, David left to pursue a career in archaeology and subsequently worked the British field circuit for a number of years. He has also excavated and surveyed sites in far-flung places such as Croatia, Turkmenistan, United Arab Emirates and Jordan. His experiences at York helped him form a keystone in his belief of the use of methodologies in archaeological practice. Currently residing in Scotland, David specializes in archaeological surveys and regularly partakes in community archaeology projects. Part 1 in this series, detailing David’s background and the inception of BAJR, can be found here. Part 2 in this series, detailing the rise of BAJR and it became what it is today, can be found here. This is the third and final part in this series. As previously reported, BAJR was founded in 1999 on the same campaigning principles as the radical Digger newsletter, and BAJR has grown into one of the most recognizable and trusted sources of archaeological employment opportunities and advice in the United Kingdom. However, to remain fixed in the past is to ignore the ever-changing environment that surrounds us all, and so BAJR is evolving in 2015 in an effort to embrace this. One aspect that remains core to the website is the provision of advertising. BAJR will continue to protect the lowest grades of workers within the industry, while providing a new platform to encourage trainees and internships, within a strictly formalised system to prevent misuse of less skilled staff as a means to cut costs. Discussions are now being held to consider the implementation of a single minima system, which relates to (mainly) the G2 fieldworker or PIfA. Here the only minima that a contractor must abide by will be this figure – currently £17,094. Any payment over £250 more than this rate would be presented with a More than Minima badge. Jump on board and help the archaeology sector gain the credit it deserves! The grading system will still remain in order to provide a background to the level of responsibility expected, but no minima will be attached. This at first sounds like an invitation to pay less, but tied to the following innovation on the BAJR website – the regional pay map – it is designed to have exactly the opposite effect, by providing a constantly updated average pay rate for various ‘standard’ grades such as supervisor, project officer and managerial posts, matched to geographic areas of the UK. Knowing the base rate, both the prospective employee can see who is paying the best rate, and employers can judge if they will be able to attract staff based on their current wage level. It is hoped that securing the basic minima, and allowing the market to dictate the levels beyond this, it will effectively cause rates to rise in order to gain the best staff. 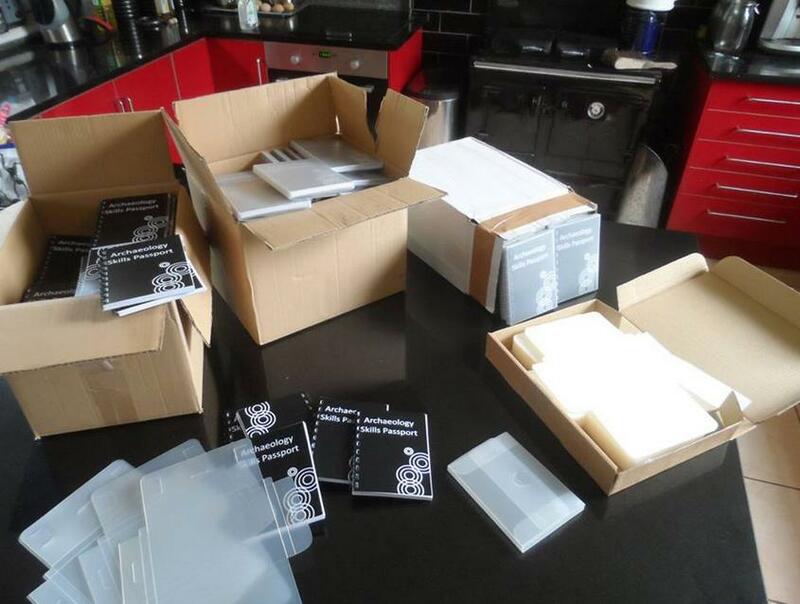 Copies of the Archaeology Skills Passports ready to be sent out. It is all about the record keeping of your achievements and hard work in the archaeology sector so that it is recognised professionally. Beyond this it is imperative that the companies are allowed the opportunity to display the range of benefits that they provide, over and above the blunt instrument of the weekly pay packet. The new BANR (British Archaeological News Resource) and the original BAJR website will include a section that allows ‘like for like’ contractor comparison. This page will include a range of benefits from overnight subsistence payment to travel time remuneration; research opportunities available from the company and even a list of recent flagship projects to show the potential a new employee can expect. Currently, there are also a number of companies who are considering the Archaeology Skills Passport as a means to broach the issue of standardized and transferable skill/training documentation. They have advised they could all save time/money by pooling resources by mapping their own individual needs (on introductory training in particular) across to the passport. Utilization of the Archaeology Skills Passport and it’s adoption as a basic training record across the profession that allows for progression – fits well with recognising the requirements for the lowest level pay rate. If you have completed the Primary Skills section in the passport, you have shown yourself worth the G2/PIfA minima rate. Otherwise you are still in training. This creates a singular goal for people because it is made clear what is required. Better than a CV and also fairer than the start at the bottom every time situation that has been so prevalent for fieldwork jobs, and we all know so well. The Archaeology Skills Passport is a handy book designed to help build up your skill base by getting a supervisor, site director or lecturer to sign off on the skills that you have completed on-site. Designated into Core Skills (Section drawing, troweling etc. ), Secondary Skills (finds processing, geophysics etc. ), and Tertiary skills (report writing, outreach etc.) sections this booklet acts as a record to your achievement. Get yours here. BAJR will always be there for anyone who needs advice on any level along with access to good quality information. The forum has been strengthened with a Facebook and Twitter presence, so discussion has become even more interesting and far-reaching. What is still black and white and read all over? Why BAJR of course… and one thing is for sure, it is you who make it so. You can read more about the project concept of the Archaeology Skills Passport here. Hang out with some diggers at the BAJR Federation Forum. Want a job in British archaeology? Start here! The new and revamped Past Horizons website has been launched for all of your archaeological news needs. The British Archaeology Jobs and Resource (BAJR) site has recently unleashed a new campaign aimed at highlighting job adverts that pay more than the minimum salary wage. The More than Minima campaign aims to highlight and recognise any job advertisement on the BAJR website that pays beyond the minima as a starting rate, which helps to promote fair pay within the archaeological industry. Advertisements that meet this criteria will have the BAJR grene thumbs up logo attached to the job advertisements, so that potential applicants can immediately know that the company and position pay above the recognised and current pay grades. 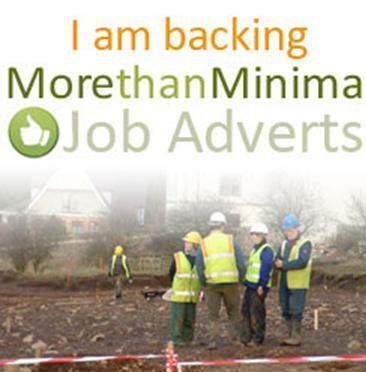 On all archaeological job advertisements on the BAJR website look out for the green thumbs up logo to show that the advertisement offers a More than Minima salary (Image courtesy of David Connolly/BAJR). “I think the point is the positivity of the campaign. This is not a punishment driven proposal, it is one that commends the companies that try that little bit extra to provide better pay (and conditions) for their staff. Flagging these adverts is a way of saying thanks! It also hopefully suggests that paying better than the bare minima is a way to attract staff, who will be more inclined to feel valued. 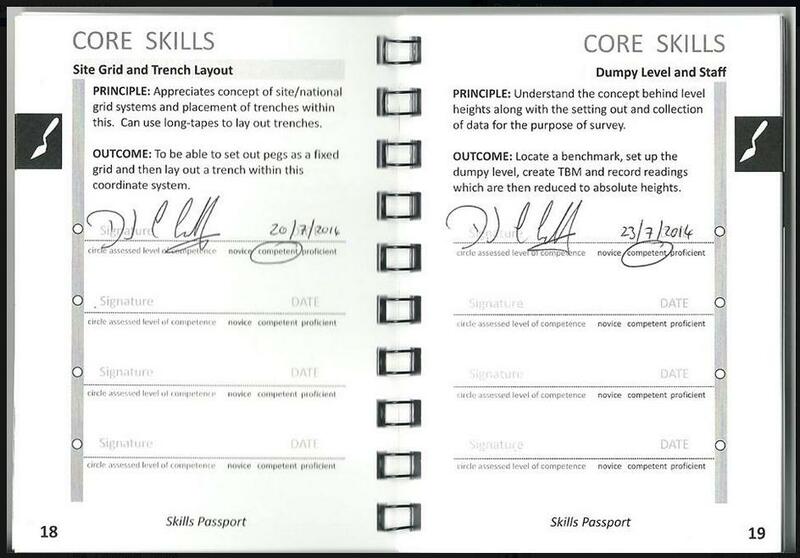 Of course the campaign will continue along with the skills passport (which is to be ready in 1 week). The real battle is in getting the archaeologists to support it as well. Not to take below minima jobs, not to accept poor pay and not to continue the fallacy that any job is better than none. The new campaign follows hot on the trail of the announcement this week that the rising levels of interest rates and inflation rates threaten the recovery of the UK economy. Whilst it is hoped that the rise in wages will outpace inflation in the long term, it is news that will worry many. Archaeology is a profession that has long been undervalued, both in terms of actual inherent worth and in the many diverse skills that the sector and it’s employees actually have. Here at These Bones of Mine I heartily endorse the new campaign and hope that you to can join in and spread the word about it as well. We must not, as archaeologists, undersell or undervalue our skilled industry. As such I believe that this campaign will benefit not just the job seeking archaeologist and the companies themselves, but archaeology as an industry by setting an industry standard. The recent approval and success for the Chartership of the Institute of Archaeologists has come at a great time for the archaeology industry, but we must continue to promote the value and wealth of the archaeology profession as a whole. The More than Minima is one more such campaign and I urge you to back it. See the BAJR forum for the announcement of the More Than Minima campaign and for some reaction from the archaeological community.